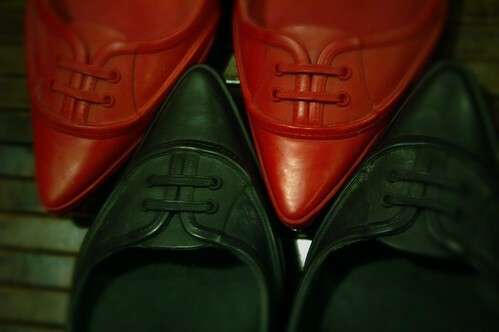 While I was visiting Portland, my co-conspirator in all things vermillion, Miss Nubby Twiglet, thrifted a beautiful pair of Sigerson Morrison Rain or Shine flats. The ever-attentive Ashe Mischief pointed out that Tricia from Bits & Bobbins thrifted a pair of the same shoes that very week. Then, on a tip from Miss Mary Bee, what should I find in my neighborhood thrift store? Why is this shoe showing up everywhere in thrifty places? Are we just incredibly lucky? I may never know, but I’m amped to rock my new kicks around the bay! Have you found a pair in your local thrift store? That is so strange…I wonder where they’re all coming from?!! I can’t believe that you scored both of those colors. So lucky! The craziest part is that you all managed to find them in your size. It’s so strange and wonderful that they keep popping up for all my favorite stylish ladies to find! In such pristine condition,too. They’re quickly becoming members only jackets, but shoes and not jackets. i love these so much, I must tell you that I have seen them in multiple TJMaxx stores in abundance recently. Randomness.